It was the same thing for recordings taken on the East Demerara areas and in West Berbice. In Region Six, the rainfall was less but still a formidable 3.96 inches. Today, the rains are expected to continue, similar to conditions being experienced yesterday, the Ministry said. According to the Ministry, showers can be expected mostly along the coast tomorrow. Already, NDIA has intensified deploying “a significant number of personnel and equipment being deployed to vulnerable areas to implement necessary interventions”, the Ministry said. 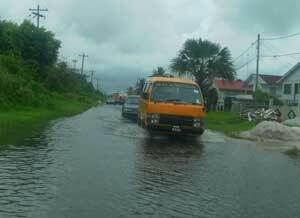 In Region Two, as a result of heavy rainfall, water levels were high in residential and farming areas. Areas affected include, Lima, Anna Regina, Henrietta, Richmond, Bush Lot, Reliance, Better Success, Westbury, Affiance, Columbia, Queenstown, Zorg, Johanna Cecelia and Supenaam. Water accumulated in the Golden Fleece and Iteribisi conservancies and as a result there was overtopping of the Golden Fleece conservancy. In Region Three, water levels were high in Canal No. 2 Polder, Pouderoyen and Patentia. “Other areas affected include Sans Souci, Wakenaam, Waterloo, Dorn Haag, Leguan, Western Hogg Island, low areas of Windsor Forest, Bell West, Oku Canal No.1. NDIA excavators were also working at Canals Polder, Windsor Castle and Parika back. “In addition, the NDIA has completed the rehabilitation of the Stanleytown pump bypass channel and has re-deployed a mobile pump from Leguan to Blankenburg. In Region Four, high waters are reported in all areas of the region. Areas affected include the low areas of Unity, Vryheid’s Lust, sections of Lusignan, Montrose, Annandale, Bee Hive, Craig, Friendship, Diamond, Providence, Peter’s Hall. High water levels in canals in Montrose and Cane Grove were reported. The doors at Greenfield were open after the NDIA’s dredging equipment cleared the Greenfield outfall channel. One of the doors at Hope was also opened providing additional relief for residents in the area. Drainage pumps are operable at Hope, Melanie Damishana and Victoria. Excavation of the Triumph pump basin has been completed along with the excavation of the Annandale bypass and installation of tube. Tractor pumps will be installed at Craig, Friendship and Herstelling, East Bank Demerara while the NDIA completed repairs to the Mosquito Hall sluice winch. Excavation works are currently ongoing at Alliance Road, Timehri. 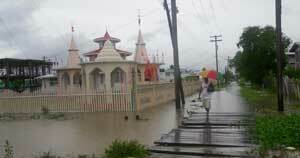 A mandir in Better Hope, East Coast Demerara. In Region Five, there was accumulation of water at Blairmont and Ithaca with an increase in water level in the upper reaches of the Mahaica, Mahaicony and Abary Creeks. Heightening of embankments at Mahaicony was being undertaken yesterday, the Ministry said. In Region Six, areas affected include No.19, Sheet Anchor with minor accumulation in Johanna and Mibicuri housing areas. In Region Ten, rainfall was reported in Kwakwani with accumulation of water at Coomacka mines. There were reports of high waters in areas of Kara Kara Creek. In Georgetown, there was flooding in some low areas of South Georgetown, Bel Air and sections of Queenstown. 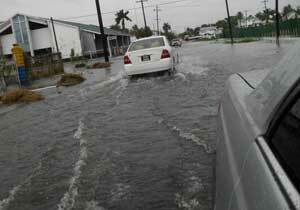 There were also high waters in the low sections of Sophia and sections of Newtown and Kitty. In GuySuCo cultivation areas, there were reports of accumulation of water in some low fields in LBI and Enmore estates. In addition, there were reports of high water at Montrose and Good Hope. Two drainage pumps at Good Hope would have been placed to service last night. Agriculture Minister, Robert Persaud, who is currently attending a meeting in Kenya, has been updated on the situation and the Ministry’s response to deal with current heavy rainfall. The Ministry of Health also issued a number of flood safety tips which included staying out of the waters and taking precautions from mosquitoes. Prime Minister, Sam Hinds, in a statement, said that in excess of eight inches fell within 72 hours in the city and outlying areas. “His Excellency, the President, Minister of Local Government and Regional Development, Kellawan Lall, and Transport and Hydraulics, Robeson Benn, are out assessing the situation. The PM disclosed that citizens unable to occupy their homes can contact the Civil Defence Commission on telephone numbers 226 -8815, 226-1114, 226- 1117.